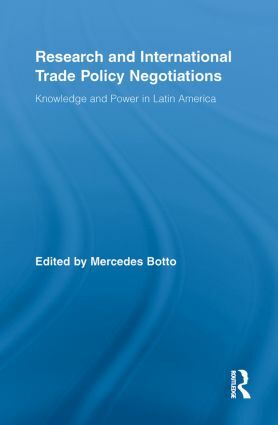 The international trade negotiations that were launched throughout Latin America in the 1990s created significant challenges for developing countries because of their complexity. In order to make informed decisions and successfully legitimize negotiating positions, governments and stakeholders required research, evidence and data from knowledgeable sources such as local technicians and academics. This book provides empirical-based analyses on the role of this research in the policymaking process. Each case study is based on primary fieldwork - either at the national or sectoral level - which was guided by the following overarching questions: Who are the main actors producing useful research for trade policymakers? Who are the main financial supporters of such work? What use do policymakers give to research? The volume offers a deep analysis of the nexus and interactions between the academic and public spheres, among researchers and decision-makers. Contributors also address the main obstacles for creating a virtuous circle between research and decision-making as they examine the links between the research centers, think tanks and international organizations who produced the information and the Latin American governments who used it.